We are on a waiting list for Adante Independent Living. It was a very positive visit. They have very nice rooms and cottages. The staff is capable, they have a lot of activities, they have a gym, a swimming pool, and functions every night. They offer two meals a day, they do housekeeping, and there's a guest house, which was important to us. We can use the clubhouse at no charge, unless we hire kitchen help. The best way to get to know a community is by scheduling a tour. See the facilities, meet the staff and residents, and get a feel first hand what it's like to live at Adante Indpendent Living Independent Living. In an upscale Northwest San Antonio neighborhood, Adante San Antonio is the clear choice for today's savvy retirees and their families. Medical services, shopping, restaurants and hospitals are all close by. Convenience is built right in. 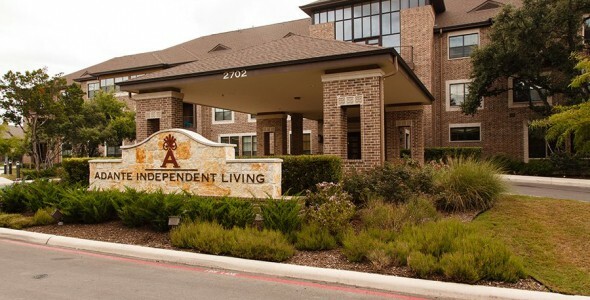 Adante San Antonio modernizes and redefines the retirement experience. From spacious independent 1 & 2 bedroom living apartments to 1, 2 and 3 bedroom cottages, designed for your comfort with every need addressed with style and compassion. We have an abundance of amenities designed for you. In our independent living you are provided 30 meals per month (in addition to a daily continental breakfast) weekly housekeeping, all utilities paid (excluding telephone) extensive lifestyle program, emergency response system, scheduled transportation, fitness center, heated swimming pool, health & wellness program, library, computer lounge, full kitchens, theater, chapel, beauty salon/barber shop, billiards room, craft room, casual cafe, wellness room/spa and an on-site club house featuring a living room with fireplace, game room, swimming pool with spa and cabana. Simply San Antonio, Absolutely Adante.